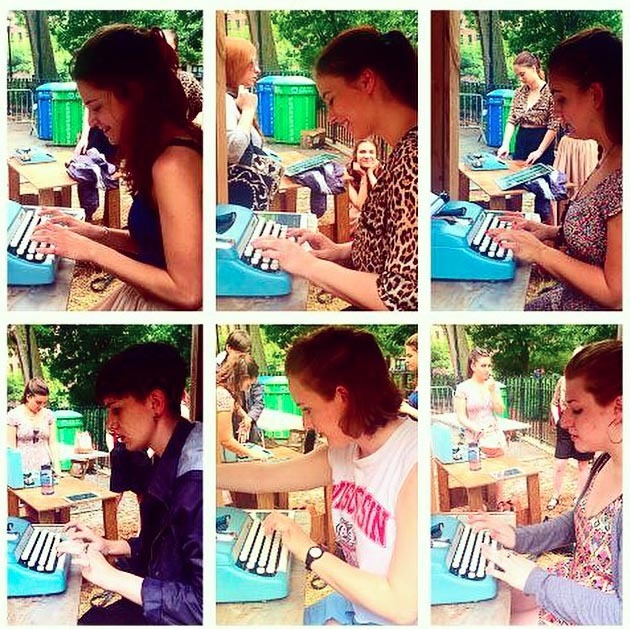 The Typewriter Project is currently active in Tompkins Square Park in New York City. "The Typewriter Project is a series of site-specific literary installations which encourage users to go analog. These typewriter installations—wooden booths with a seat, desk, and typewriter inside—allow both professional writers and first time typists alike to join in a citywide lyrical exchange. Each booth is outfitted with a seat, desk, typewriter, 100-foot scroll of paper, solar generator, hidden tablet, and a USB typewriter kit, which allows every written entry to be collected, stored, and posted online for users to read, share, and comment upon. The Typewriter Project investigates the subconscious of the city by creating unique spaces designed for contemplation in which users can contribute to narrative of that particular location." Since reading about this project (fab, wish I could go there!) I have been looking for a roll of 10 inch paper to type on. I'd love to read some of those responses.